As a global city, Singapore cannot afford to grow too slowly, he warned. "Many leading global cities grow at about 2.5 per cent to 3.5 per cent, faster than the national average of the countries that they are a part of. London has averaged 3.3 per cent annual growth since the financial crisis. Sydney, 2.9 per cent." A city whose growth comes in under 2 per cent annually will be unattractive to investors and talent, including its own, he said. Singapore's economy last year grew 3.5 per cent. This came after it expanded just 2 per cent and 1.9 per cent in the previous two years. 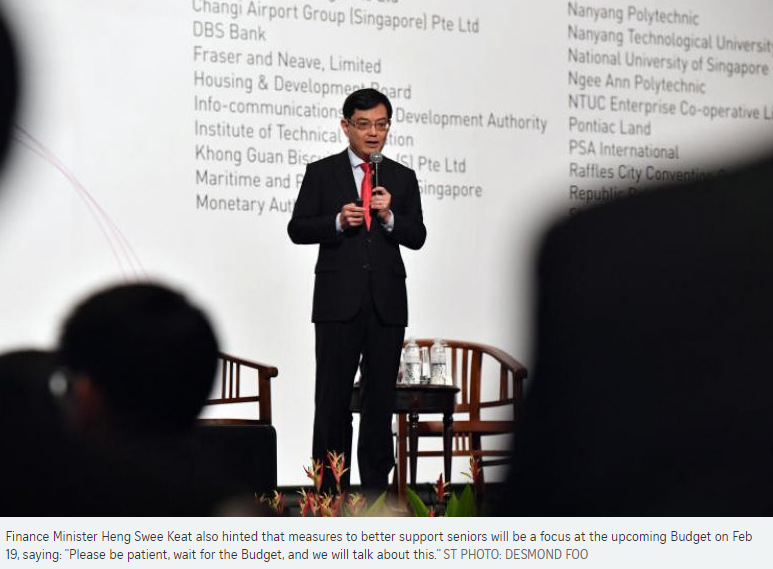 The fourth-generation ministers are a "serious-minded" and cohesive group who try to do their best for Singapore, Finance Minister Heng Swee Keat said yesterday about the team he is tipped to lead as a contender for the prime minister's position. "I really enjoy working with... everyone on the team," added Mr Heng, in his first remarks on leadership succession since the issue was put under the spotlight this year. The topic, which Emeritus Senior Minister Goh Chok Tong described as an urgent issue in a Facebook post on Dec 31, came up again yesterday at a conference. Mr Heng was asked if he was ready to be Singapore's fourth prime minister during a question and answer session. He did not answer it directly, but said the crucial factor is for the fourth-generation ministers to work cohesively as a team to ensure Singapore thrives in this age of complexity. Prime Minister Lee Hsien Loong has set a very good example on this front, he said, adding that the Cabinet gathers every week to discuss a whole range of topics that are of importance to the country. The issue of leadership renewal has become more urgent since PM Lee has said repeatedly that he will step down after the next General Election, which is due by April 2021. Besides Mr Heng, the two other front runners for the top job are Minister in the Prime Minister's Office Chan Chun Sing and Minister for Education (Higher Education and Skills) Ong Ye Kung. The trio plus 13 ministers and office-holders who form the fourth-generation team had said in a joint statement on Jan 4 that they were working closely to pick a leader among themselves. It was in response to Mr Goh's post, in which he urged the team to pick a leader in six to nine months. Deputy Prime Minister Teo Chee Hean also touched on the topic during the day-long Singapore Perspectives 2018 conference organised by the Institute of Policy Studies. He said Singapore's leadership must not become aged, as a certain vitality and energy are needed to lead a country. "You don't want a whole nation to be held hostage by the health of a cohort of people who are already senior, and getting more and more senior with each passing year, so you need leadership renewal," he said to a question on whether there should be more older ministers in the Cabinet to reflect the views of older Singaporeans in an ageing population. He added that he hoped the younger ministers would see the benefit of having "more senior" members in Cabinet to ensure continuity. Describing this as one of the unique features of Singapore's political system, he said former prime ministers have remained in Cabinet as senior ministers and minister mentor, and this had been a "great help" for younger ministers like himself in the past. Founding Prime Minister Lee Kuan Yew stayed on as senior minister after stepping aside, and was later made minister mentor. Others had also held the post of senior minister, including Mr Goh as well as former deputy prime ministers S. Rajaratnam and S. Jayakumar. On the interest in the subject of leadership renewal, Mr Heng said he was happy Singaporeans believed good political leadership was important for the country. This was not the case in many countries, where people have lost confidence in their leaders and often mocked them, creating an environment that makes it hard to govern, he added. Mr Heng also said good leaders are needed in all fields, including the social and economic sectors. When asked about his health, as he had collapsed from a stroke in 2016 during a Cabinet meeting, he quipped: "I am very glad that I am back at work and doing a lot of things as I used to, except that I take my exercise even more seriously now." He added that his doctors were surprised he had a stroke as he was deemed to be at low risk. He quoted them a message oft-cited when he was in the police force earlier in his career: "Low risk doesn't mean no risk." SINGAPORE - There is a certain vitality and energy needed to lead a country, and the leadership of the country must not become aged, said Deputy Prime Minister Teo Chee Hean on Monday (Jan 22). "You don't want a whole nation to be held hostage by the health of a cohort of people who are already senior and are getting more and more senior with each passing year, so you need leadership renewal," he added at the Singapore Perspectives 2018 conference organised by the Institute of Policy Studies. But he said he hoped the younger generation of ministers would see the benefits of having some "more senior" members in the Cabinet to ensure continuity. He was responding to a member of the audience, who wanted to know if there could be a larger representation of older people in Cabinet and the Civil Service so that there are more policymakers who can represent the point of view of older people in Singapore as the country ages. Mr Teo, who is also Minister-in-charge of the civil service, acknowledged that it would be useful to have some "more senior" members in Cabinet to ensure continuity. In fact, he said, this is one of the unique features of Singapore's political system, and former prime ministers have remained in Cabinet as senior ministers and minister mentor after stepping down. This was beneficial and a "great help" for younger members of the Cabinet in the past, he said of his own experience. He hopes the younger leadership would also see the usefulness and benefits of such an arrangement. Mr Teo said he has asked the Civil Service to look at older people when recruiting, since they make up the fastest growing sector of workers. Redesigning jobs can help seniors continue to work and build up their retirement nest egg, he noted. This could involve sharing a job between a senior and a young parent who prefers not to work at full tilt because they have young children, so that both benefit. Mr Teo said technology can also be tapped to redesign jobs, to make work arrangements more flexible and allow seniors to take part in the gig economy as well. A concerted effort by individuals and families, communities and workplaces is needed for seniors to remain in the workforce for as long as they are able and willing to do so, he told more than 1,000 people, including policymakers, students and people from civil society at Raffles City Convention Centre. Citing a 71-year-old resident, Mr Quek Keng Hock, who showed him a yoga headstand after a feedback session in Pasir Ris, Mr Teo said society needs "to stand the way we think about ageing on its head". Seniors too, must be willing to learn new skills and stay active. "Living longer does not mean being old for longer. It means staying young for longer," he said. On the positive side, he noted that Singapore had already seen the signs of the ageing population since the mid-1980s, as life expectancy was increasing and the baby boomers had been born. Thus policy enhancements like CPF Life and MediShield Life have been rolled out in recent years, to help Singaporeans cope better financially in their old age, he said. But with healthcare costs rising, the topic of how much younger people can or should support older people is being debated. Just as how young people on bicycles and e-scooters and older pedestrians have to navigate the shared pavements, so there could be some "contestation" over the allocation of resources to the development of the young and to older citizens, said Ambassador-at-Large Chan Heng Chee during a separate panel discussion. As the population ages, health costs will be hefty, and there will be unhappiness if taxes continue to rise, she said. "Will this result in younger Singaporeans demanding a reduction in older citizens benefits? I'm sure there is a tipping point," she said. She noted that "we are not there yet". A Raffles Girls' School student also pointed to this potential conflict, when she asked if using technology in workplaces to help seniors would artificially skew the job market in their favour. Prof Chan, who is chairman of the Lee Kuan Yew Centre for Innovative Cities at the Singapore University of Technology and Design, replied that enabling technology does not help those who are unable to work, but it can make up for strength or other qualities that people lose when they age. In fact, a lot of money is spent on the young, through schools, good facilities and overseas exchanges, she said. For solidarity and harmony, older people could show they are willing to take a lower pay package so that some of that pay can create new jobs, she added. Fellow panellist Laurence Lien, who is chairman of the Lien Foundation, highlighted how it is key to engage older people instead of seeing them as a liability, as society ages. In fact, the age of 65 may no longer be relevant as a benchmark, he said. For example, in 1999, the labour force participation rate for residents aged 65 and above was 12.4 per cent, while in 2014 the rate for those aged 70 and above was 15.3 per cent. Also, in 1999 there were 10.8 older people per 100 people aged 20 to 64, while in 2014 there were 9.9 older people per 100 people aged 20 to 70, he said. He suggested changing work structures so that younger people and older people work side by side with one another, building on each other's strengths. Seventy is the new 65, and some even say the new 50. This was suggested at a conference by several panellists yesterday when they called for a relook at the higher limit of the working age, which is now 64. They said, during a discussion on ageing and its impact on society, that those turning 65 and older down the road will be better educated, more financially secure and healthier than the cohorts of seniors before them. They will likely be able to continue supporting themselves and one another. Seeing them as depending only on the young and competing for limited resources with the young could not be further from the truth, they said at the Singapore Perspectives 2018 conference. This point was made by Dr Kanwaljit Soin, an orthopaedic and hand surgeon, and Mr Laurence Lien, chairman of the Lien Foundation, when they spoke about how misconceptions on ageing have given rise to the narrative that older folk are a liability to the young. Dr Soin said the greying population has often been cast in a negative light because policymakers have used an outdated old age dependency ratio to measure the burden on the workforce. This oft-cited ratio measures the number of working Singaporeans between the ages of 20 and 64 for every person aged 65 and older. It was 7.7 in 2007, and fell to 5.1 last year, and is projected to drop to 2.1 by 2030. Calling it alarmist, Dr Soin said that it assumes the experience of the present generation of older Singaporeans can be extrapolated into the future. But the 2030 seniors will be less financially dependent and will, in fact, be important contributors to the economy, she said. For instance, they will pay goods and services taxes as consumers and also generate opportunities in the financial, insurance and legal industries with their assets. The older generation is also transferring wealth from one generation to the next in their families, Dr Soin said. "How many of us have helped our children to buy their first apartment or first car?" With successive generations of seniors more likely to remain economically active until an older age, the pooling of risk for MediShield Life will also be increasingly spread out between older people who are better off and those who need more help, she added. "Please remember, it is not money coming from the Government or taxes of the young people," she said. Dr Soin, who has spoken often about ageism, said there is a structural lag of many years between public policy and the lived experiences of older people. Mr Lien, who was at a separate panel, said the 65 benchmark for seniors should be moved to 70. That would present a more optimistic picture of ageing which is closer to reality, he added. For instance, people are working longer. The labour force participation rate for residents aged 65 and older was 12.4 per cent in 1999, while that for those aged 70 and older was 15.3 per cent in 2014. Mr Lien suggested changing work structures for younger and older people to work side by side. "If everyone is working in parallel... we will not see older people as dependent people." Panellist David Canning, a visiting professor at the Lee Kuan Yew School of Public Policy, said that setting the working age range to start from 20 also distorts the dependency ratio. He noted that the average young person earns enough to be financially independent only at 27. "We need to have more realistic numbers," he said. Older pedestrians must now contend with young people on bicycles and e-scooters, with both groups having to navigate the shared pavements. Similarly, there could be "contestation" over the allocation of resources to older citizens and to developing the young, Ambassador-at-Large Chan Heng Chee said yesterday. She pointed to the unhappiness that could arise if taxes continue to go up to pay for hefty health costs as the population ages. "Will this result in younger Singaporeans demanding a reduction in older citizens' benefits? I am sure there is a tipping point," she said. Singapore has not yet reached that point, said the veteran Singapore diplomat, who delved into the potential conflict between the young and old during a panel discussion on the political and social dimensions of ageing. But though generational wars sound far-fetched, generational conflict and tensions do exist in Asia and in the West, she added. "In Asia, culture, tradition and context will play a role in shaping the acceptance of burdens and the allocations of resources," she said. Singaporeans generally support policies that give social support to the needy, noted Professor Chan, who is chairman of the Lee Kuan Yew Centre for Innovative Cities at the Singapore University of Technology and Design. She questioned, however, if the tolerance for tax increases will remain. Jobs could be another source of tension between generations as Singaporeans age, she said. New jobs must be created for seniors to replace roles removed through automation, while there will also be pressure from young people who want to move into top roles occupied by seniors. A Raffles Girls' School student highlighted this emerging generational conflict, when she asked if the use of technology to help seniors do their jobs would artificially skew the job market in their favour. If the senior in question is actually incapable of doing that job, wouldn't it be unfair to younger people who are searching for and working hard for jobs, she asked. Prof Chan replied that enabling technology does not help those who are unable to work. Rather, it can make up for the loss of strength or other qualities due to ageing. In fact, a lot of money is spent on education for the young, through schools, good facilities and overseas exchanges, she said. Medical professor and Singapore Democratic Party chairman Paul Tambyah commented that the younger generation feel they do not enjoy good job prospects because of older people holding on to positions. Prof Chan said that for solidarity and harmony, older people could opt to take a lower pay package so some of that money can be used to create new jobs. At a separate panel session, DBS chief executive Piyush Gupta suggested a future work system that balances the job needs of both young and old. He noted that technology will reduce the number of jobs in organised sectors and large corporations, while the gig economy will be more widespread. Seniors - who have more "crystallised intelligence" and some money saved - would be better equipped to be part of the gig economy and take on entrepreneurial roles, and there should be a social support system to help them do so, he said. For young people joining the workforce, it will also be important to create a flow of jobs that they can move into in a systematic way. The key to sustaining a dynamic economy in the face of an ageing population is inclusivity - and this means having a society that is willing to pay the taxes needed to support those left behind by globalisation and technological advancements, said Monetary Authority of Singapore managing director Ravi Menon. "Being inclusive… is the morally correct position to take," he said on Monday (Jan 22) at the Singapore Perspectives 2018 conference organised by the Institute of Policy Studies (IPS). "The ability of societies to sustain dynamism, continue to be open to globalisation and technology and deal with the dislocations is going to depend on the Government's fiscal resources to a great extent." Add to that the effects of an ageing population, and the willingness of society to pay taxes - especially those who have gained from economic growth - to support the less well-off is quite critical, he added. An IPS survey last week found that Singaporeans were divided on the issue of whether people should pay higher taxes to fund higher social spending on the elderly, or whether the national reserves should be tapped. Two in five respondents - or 40 per cent - said they were not comfortable with higher taxes and would rather tap reserves, while a slightly lower proportion - 34 per cent - indicated the opposite. The remainder were neutral. At a question-and-answer session at the conference, which was held at Raffles City Convention Centre, Mr Menon noted that Singapore faces a demographic challenge, as the decline in fertility rate and an ageing population will mean slower economic growth in future. But while Singapore must accept a lower rate of growth than before, as a global city, it cannot afford to grow too slowly either, he warned. "Many leading global cities grow at about 2.5 to 3.5 per cent, faster than the national average of the countries that they are a part of. London has averaged 3.3 per cent annual growth since the financial crisis. Sydney, 2.9 per cent." A city whose economic growth comes in under 2 per cent annually will be unattractive to investors and talent, including its own, he said. "A reasonably good rate of growth helps to create opportunities and preserve a sense of progress and hope, particularly among the young. It will also facilitate upward social mobility." Given this, it is important to maintain economic dynamism even in the face of demographic challenges, Mr Menon said. "A dynamic economy is not necessarily inclusive, but to sustain that dynamism, to sustain openness and that go-getting spirit, we do need to be inclusive." Another key to promoting inclusivity and sustaining economic vibrancy is improving productivity and efficiency in many domestic services jobs, Mr Menon added. He said productivity improvements accounted for two-thirds of gross domestic product (GDP) growth in cities such as Hong Kong and London, while it accounts for only half of GDP growth in Singapore. Taking four jobs as an example - plasterer, baker, childcare worker and security guard, he noted that in Singapore, the average pay of these four jobs is 30 per cent to 60 per cent of the local median wage. In Australia, the United States and Britain, these occupations command much higher wages, closer to the national median wage. There is scope to further professionalise such jobs, increase skills, leverage technology, improve business processes and improve the quality of output, which will enhance productivity and support higher wages, Mr Menon said. "In fact, professionalising much of the so-called rank-and-file jobs in Singapore will help to strengthen and broaden the middle class, which will make for a more equitable society," he added. One success story in Singapore, he noted, are bus drivers. The introduction of the bus contracting model and foreign players here injected competition into the sector, which professionalised bus driving. Workers were given more training and more women were drawn in with flexible work arrangements and maternity leave benefits. Dependence on foreign workers in the industry has fallen, productivity has risen and so have wages. Bus drivers in Singapore now earn salaries that are almost equal to the national median wage. "Every job has dignity, and the more we recognise and practise that in our societies, in the way wages are determined, will go a long way towards creating an inclusive society," said Mr Menon. He noted that Singapore has taken steps over the years that will put it in good stead in the years to come, even in the face of demographic challenges. For example, Singapore has scope to reap dividends from the investments it has made in education and training in the past decades, he said. He noted that as recently as 2000, 45 per cent of the resident workforce had below secondary education while 12 per cent had a university education. In just 15 years, the proportion of resident workers with below secondary education has dipped to below 30 per cent, while the proportion of university-educated workers has more than doubled to nearly 30 per cent. "The effects of this transformation in human capital endowment will continue to be felt in the productive capacity of the workforce. With higher levels of education, the ability of the workforce to take on more complex tasks and leverage technology is substantially stronger." Another encouraging trend is the fact that Singapore has become more selective about its foreign workforce, taking in a higher proportion of skilled professionals versus blue-collar workers over the past decade, Mr Menon said. "This trend must continue as we restructure the economy towards higher-value, deeper skills and more pervasive digitalisation." The issue of taxation has been in the news, with Prime Minister Lee Hsien Loong having signalled that taxes would need to rise to support growing infrastructure and social spending. He did not give details about the taxes that will be raised and when it will happen, but many expect that this will be revealed in the Budget to be delivered on Feb 19. This is an edited excerpt of a speech by Monetary Authority of Singapore managing director Ravi Menon at the Singapore Perspectives 2018 conference on Monday. He spoke about sustaining economic dynamism in the face of demographic challenges. Singapore has a falling total fertility rate and an ageing population. The result: a dwindling labour force, which curtails economic growth. The country thus has to consider net immigration, adding to the number of citizens and permanent residents who can live and work in Singapore. It also needs to allow good-quality foreign workers to beef up the workforce, he stressed. But in the end, economic dynamism is not just a numbers game. 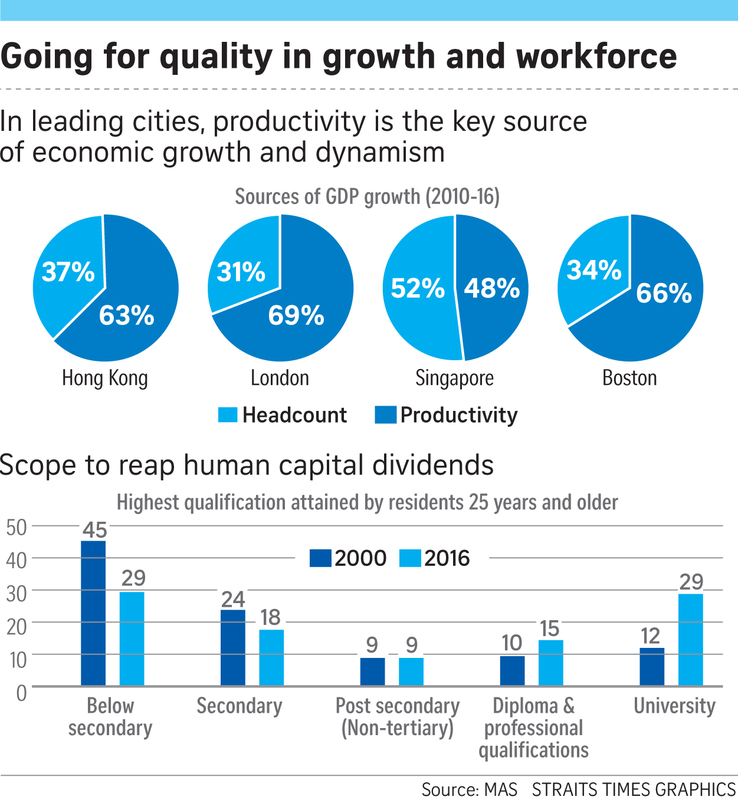 Raising productivity and having an open-minded, adaptable, well-educated workforce can help Singapore sustain its dynamism. Gross domestic product (GDP) growth can be seen as the sum of productivity growth and labour force growth. This means, holding productivity growth constant, a decline in labour force growth will have a direct impact on economic growth. If labour force growth falls to near zero, then the only source of GDP growth is productivity growth. If productivity growth stays at about 1.5 per cent, which is what we have likely averaged over the last seven years (based on mid-year employment), then GDP growth will approach that level. So, what are the trade-offs? If we want labour force to grow and have zero net immigration, then we have to allow the share of foreign workers in the workforce to rise. If we want the overall labour force to grow and the share of foreign workers to be stable, then we have to allow net immigration. If we want zero net immigration and the foreign worker share to be stable, then we have to accept zero labour force growth. This is the demographic trilemma. Are there ways to escape the trilemma? Or at least soften its hard constraints? There are two solutions often mentioned. First, an increase in fertility. Second, an increase in resident labour force participation rate. A recovery in Singapore's TFR (total fertility rate) is the best and most lasting solution that we can have, but its positive effects on labour force will only occur in the very long run. A recovery in the TFR will not have any perceptible impact on labour force and GDP growth until nearly 2040. It will take time for the extra babies born in the next 15 years to start entering the labour force. So while it's the most lasting solution to our challenges, TFR effects will only impact the economy in the long run. The second way to soften the trilemma is to increase our resident Labour Force Participation Rate (LFPR). This will have more immediate payoffs. But even at plausible stretch targets, its effects on resident labour force growth will be quite limited. Singapore's LFPR - defined as the share of the resident population aged 15-64 who are in the labour force - is currently 75.4. It is not bad by OECD standards but there is scope to improve it. Japan is at 76.8; Germany is at 77.9; the Netherlands is at 79.9; Sweden is at 82.1. Our LFPR for older workers is not bad; it is female LFPR where we are lagging behind. There is currently still a fairly large gender LFPR gap between males and females in their 40s and 50s. This gap in Singapore is higher than that in leading OECD countries. In many advanced economies, women tend to return to the workforce after their prime child-bearing years. In Singapore, this is much less prevalent. If we can make it easier for our women to return to the workforce after they have had their children, we can narrow the gender gap vis-a-vis the advanced economies. Assume we narrow our gender gap from the current 15 per cent points to 11 per cent points by 2035 - approximately the level seen in Germany and Netherlands. This will only translate into a cumulative labour force increase of about 2 per cent in 2035. The demographic trilemma presents the constraints and choices facing us. We can soften it by raising the TFR and LFPR. Of course, having babies or returning to work are deeply personal choices. The Government tries to facilitate fertility and labour force participation because that is what many people desire for their own fulfilment. Many women would like to return to work, but they face a number of constraints. We must make it easier for them to do so. The Government has made significant efforts in recent years to invest in childcare and facilitate more flexible working arrangements. We must continue to push on this front and, collectively as a society, enable more who want to work enter the workforce.We must make balanced choices in addressing the trilemma. We must accept a slower rate of labour force growth. The underlying demographic slowdown is so severe that it is neither feasible nor desirable to try to completely offset it through immigration or foreign workers. But we must also allow a certain rate of net immigration to augment our resident population. This is not just about numbers but about rejuvenation and expanding our talent base. While we cannot keep increasing our share of foreign workforce indefinitely, we must be flexible in allowing fluctuations in the ratio according to economic cycles, changing circumstances and opportunities. Finally, we must reframe our question on foreign workers. It is not about how many foreign workers industry wants or society can afford to have, but what number and kind of foreign workers we need to maximise the job and wage opportunities for Singaporeans. Foreign workers must be a complement to the local workforce. Let me move on to the second broad theme: that demographics is not destiny. We can sustain our economic dynamism in the face of demographic change. First, we should not grow despondent over our slowing rate of economic growth. Countries with low level of GDP per capita tend to have higher rates of GDP growth. This is called "catch-up" in the literature. Meanwhile, countries with higher levels of GDP per capita tend to grow at slower rates as they are more mature. Singapore is a mature economy: It has one of the highest levels of per capita income in the world. We will not be able to sustain 6-7 per cent rates of growth that were seen a decade ago. But while we must accept a lower rate of growth than before, as a global city, we cannot afford to grow too slowly either. Many leading global cities grow at rates of 2.5-3.5 per cent, faster than the national average of the countries they are part of. London has averaged 3.3 per cent annual growth since the financial crisis, while Sydney has averaged around 2.9 per cent. San Jose (which encompasses Silicon Valley) has averaged 2.7 per cent p.a. It is hard to imagine a dynamic city growing at less than 2 per cent or worse still, 1.5 per cent. It will be unattractive to investors and talent, including the city's own investors and talented people. A reasonably good rate of growth helps to create opportunities and preserve a sense of progress and hope, particularly among the young. It will also facilitate upward social mobility. The experience of other leading cities suggests that demographics is not destiny. Yes, vibrant cities do attract people - and their additions to the labour force add to growth. But the main source of their growth and dynamism is not headcount but productivity. About two-thirds of overall GDP growth in the cities mentioned above is due to productivity improvements. In comparison, productivity has accounted for about half of Singapore's GDP growth. There is clearly scope for us to do better and thereby sustain our dynamism. First, Singapore has scope to reap the human capital dividends that are arising from the continual investments we have made in education and training in past decades. As recently as 2000, 45 per cent of resident workforce had below secondary school education, and only 12 per cent had university education. In just 11/2 decades, those ratios have converged, reflecting the cumulation of efforts made over preceding decades: The proportion with less than secondary education has dipped below 30 per cent, while the proportion of the university-educated has more than doubled to nearly 30 per cent. The effects of this transformation in human capital will continue to be felt in the productive capacity of the workforce. With higher levels of education, the ability of the workforce to take on more complex tasks and to leverage technology is substantially stronger. There is still plenty of scope to increase the share of those with secondary, post-secondary and diploma and professional qualifications. They will be better placed to transform the nature of many jobs, raising standards and quality, thus enabling productivity and wages in these occupations to rise. Second, there is scope to improve the quality of the foreign workforce. We should increasingly be concerned about the skills of the foreign workers that we take in, rather than just the numbers. In fact, more skilled foreign workers will mean that we will need fewer of them. The trend of improving quality in our foreign workforce has already begun. The proportion of work-permit holders has declined by about 10 percentage points over the last 10 years, while the proportion of S Pass and employment pass holders has increased by around 10 percentage points. This trend must continue as we restructure our economy towards higher value-added activities, seek deeper skills and undertake more pervasive digitalisation. Third, there is scope to increase productivity and efficiency in many domestic services jobs. Consider wages in four occupations (plasterer, childcare worker, baker and security guard) across four countries (Singapore, Australia, the US and the UK). In Singapore, the typical pay in these occupations range from 30-60 per cent of the local median wage. In Australia, these occupations have wages much closer to the median wage. Wages in these occupations are also higher in the US and the UK. There is scope to further professionalise these jobs in Singapore. In particular, to increase the skills content, leverage technology and improve business processes, and raise the quality of output. This will enhance productivity and help to support higher wages in these occupations. In fact, the professionalising of more such so-called "rank-and-file" jobs in Singapore will help to strengthen and broaden the middle class, and make for a more equitable society. We have good examples of jobs that have historically been perceived to be less skilled that have been successfully upgraded. These jobs now command much relatively good wages, close to those seen in Australia, the US and the UK, controlling for median incomes. Our bank tellers, vehicle mechanics, hairdressers and bus drivers earn a good (median) wage that is quite close to the median. In fact, our bus drivers appear to be paid just below the median in Singapore (96 per cent of national median wage), comparable with their counterparts in Australia, the US, the UK (107, 94 and 101 per cent respectively). And hairdressers in Singapore are doing amazingly well. They earn much closer to the median wage (82 per cent) compared with their counterparts in Australia, the US and the UK (32, 68 and 44 per cent). The story of our bus drivers is interesting. Since the introduction of the Bus Contracting Model by the Ministry of Transport and the entrance of foreign bus operators, there has been greater competition in the bus industry, raising the game. Bus driving became more professional. The focus is on driving well, increasing fuel efficiency and meeting the targets set by the Ministry of Transport on frequency and timeliness. More women have also been drawn to the industry with the introduction of flexible working arrangements and maternity leave.The result is that the dependency on foreign workers has been reduced and productivity and wages have increased. Now our bus drivers are making close to the median wage in Singapore. Demographics is not destiny and economic dynamism is not about numbers. Dynamism is about quality - the quality of our workforce, the quality of our enterprises and the quality of our institutions. It is about high levels of efficiency and productivity. It is about growing the Singaporean talent base as well as being a magnet for the world's talents. It is about a vibrant entrepreneurial and innovation base, characterised by a lot of start-ups, a lot of experimentation, and a lot of research and development (R&D). Finally, dynamism must be about our people. We must remain an open society. Not just in being open to foreign trade, investment, and talent, but being deeply connected to the rest of the world. Not just attracting foreign talent to Singapore but Singaporeans venturing abroad as our companies and industries internationalise. Most of all, being open in spirit and mindset, staying open to diversity, being comfortable working in multicultural settings, thriving in a globalised world, having an enterprising spirit - always seeking new and better ways to do things. Singapore's 4G team addresses leadership succession issue, will pick a leader among themselves "in good time"